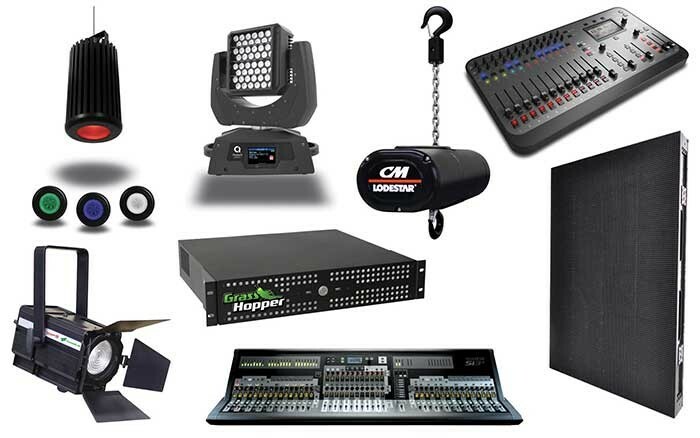 A.C. Entertainment Technologies (AC-ET) Ltd. will be showcasing products at PLASA Focus 2013 from a selection of the leading brands which it distributes, including Chroma-Q, Jands, High End Systems, Spotlight, SGM, PixelRange, Chauvet, LedGo, Green Hippo, Christie Nitro, Soundcraft, RCF, BroadWeigh, Columbus McKinnon and many more – on stand N-E2. Chroma-Q’s new award-winning Inspire high output, RGBW colour-changing LED House Light and AutoLED II ultra bright (16,430 lumens) daylight white LED moving head fixture will share their UK tradeshow debut at PLASA Focus 2013. Also on show from Chroma-Q are a selection of other intelligent LED lighting products including the Studio Force multi-purpose and Studio Force Phosphor broadcast-sector ranges of white LED fixtures available in daylight, tungsten and variable white, the hugely popular Color Force range of RGBA colour fixtures and the modular and extremely discreet new Color Block 2 Plus Nano fixture. Showing from Jands is the innovative, award-winning Stage CL console - an entry level, self contained console that has been specifically "made for LEDs". Ideal for a wide-range of venues and applications including community theatre, houses of worship, night clubs, weddings and parties - the Stage CL offers a simple and easy to use "out of the box" LED control system for anyone who has adopted LED technology, regardless of their level of lighting technical expertise. Also showing is the flagship Vista L5 8192 channel console. Featuring a sleek design, and stunning 21" HD screen, the L5 will be running Jands’ Vista v2 software - giving visitors the opportunity to come and see for themselves the power and simplicity that Vista has to offer. A selection of other models from the extensive Vista control range will also be featured. From High End Systems, the brand new Hog 4 flagship lighting console will be on show. Retaining the popular Wholehog III’s familiar control surface, the Hog 4 embraces new technologies including new encoders, jog shuttle wheel, LCD keys, motorised faders and an integrated keyboard to offer an advanced programming experience in a well-established environment. Other products on show include SGM’s groundbreaking X-5 and XC-5 LED strobe lights, Spotlight’s GreenLine range of energy saving LED fixtures, entertainment lighting technologies from Chauvet and PixelRange’s lineup of cutting-edge LED Pars and battens. Showing from LedGo will be their high-quality modular LED video panels. Brilliantly engineered and incorporating robust hardware and components, LedGo video panels deliver incredible video performance at economical prices. Green Hippo’s GrassHopper media server - running the very latest Hippotizer V3.2 software - will also be on show. With an unrestricted output resolution, the GrassHopper is a robust, rackmount-able media server that allows you to drive a single HD display or lets you get the best from output extenders such as Matrox multi-head adapters, the EMS-iVU4 or Datapath x4. Christie Nitro’s lightweight and compact YK50 dual-arm moving projector yoke will also be on display. Capable of being used as a moving light or moving video projector, the YK50 offers an impressive 7,000 ANSI lumens when combined with standard or high definition projectors such as the Christie LX700 and LHD700. From Soundcraft, the powerful Si Expression 3 digital mixing console will be on display. Featuring 32 recallable mic pre amps, four line inputs, four internal stereo FX returns and a 64x64 expansion slot, the Si Expression 3 is a highly flexible digital mixing console offering pristine audio quality at an affordable price. Also on show will be RCF’s TT051-A ultra compact, active loudspeaker designed specifically for high quality indoor nearfield sound amplification. Showing from Columbus McKinnon’s range of durable, reliable electric chain hoists will be the new and improved Lodestar, which is available in low voltage and direct control versions; and the Prostar, which features a dual braking system and overload protection for the hoist and operator. Representatives from AC-ET’s sales team will be on hand throughout the show to discuss the company’s massive portfolio of over 200 leading brands available from their specialist lighting, audio, rigging and video divisions, as well as their in-house Gel, Cable and Lamp 'express' delivery services. The Cable Express assembly service specialises in providing last minute, large volume custom orders for data, mains, multicore, audio and video cable. Drop by the stand to meet the team and receive a demo of these leading technologies and for a chance to win a bundle of swag each day of the show from various brands available from AC-ET.